Forget the preservative laden cartons of eggnog from the store… homemade is the best! All you need is 5 minutes of your time and a blender. My version mirrors the classic, with raw eggs, cream, milk, and booze, but I’ve also shared a way to make it using cooked egg yolks if you’d feel more comfortable that way. You’ve had eggnog before right? It starts popping up in the refrigerated cases at grocery stores during the Fall around here, in those infamous cartons. Store-bought eggnog is SUPER thick, like the texture of thick, melted ice cream, and mildly spiced. The other thing in that store-bought carton is a lot of additives and preservatives, used to make it that thick and ensure that it has a long shelf life. Which is all well and good, but we all know homemade has got to be better right? Except I always thought that something as complex in flavor as eggnog had to be complicated to make, so I never bothered. Well folks, I finally tried it, and I’m here to tell you… it couldn’t be EASIER! If you search “eggnog” in Google, you’ll see approximately 2.67 bajillion recipes (okay so that might be an exaggeration… but seriously, there are a lot! ), and there are several ways to make it. I’ve gone with the classic way, which does use raw eggs. Raw. Eggs. Did I lose you there? For most people, the thought of drinking raw eggs is… well, not pleasant, right? You probably have a little voice in your head going, “um, crazy lady, you can’t eat raw eggs… you’ll get salmonella!!”. Well, yes, and no. 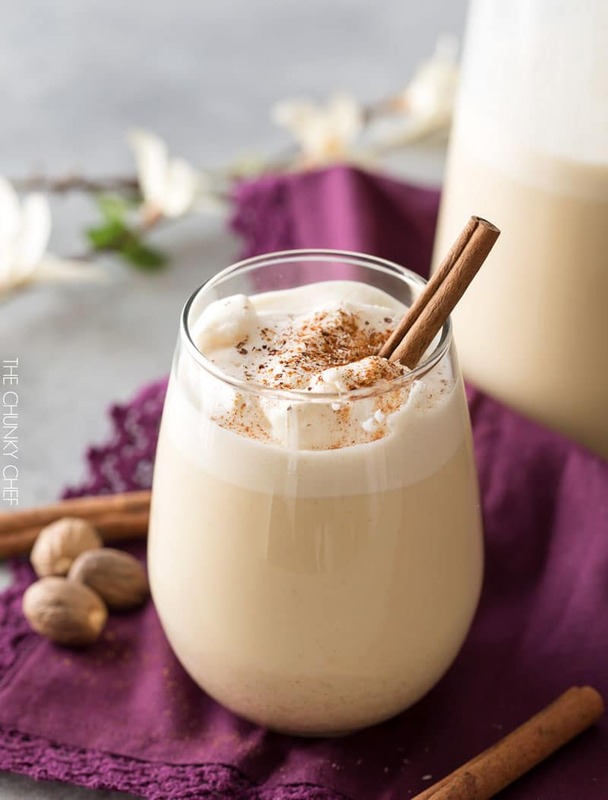 Classic eggnog is boozy, with a quite a bit of alcohol added, which essentially acts as a preservative and a sterilizer. There aren’t many bacteria that can survive in alcohol, including the dreaded salmonella. This was actually proven at a lab in Rockefeller University. Use fresh, organic eggs… the freshest you can find. 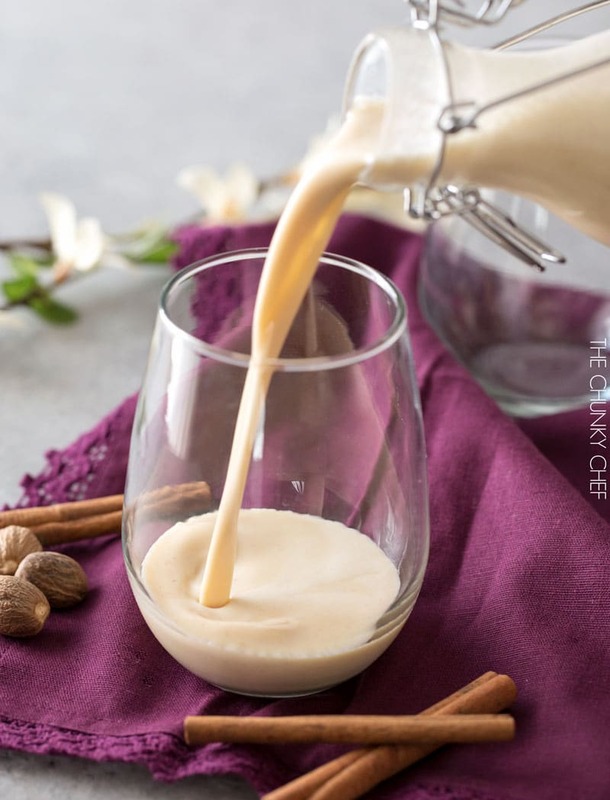 Making this version of homemade eggnog is the simplest one around… no saucepans, no tempering egg yolks, no whipping egg whites, and just one thing to wash after you’re done! Just add your raw eggs to the blender and blend on medium speed (or low, if your blender only has a high and low speed) for about 30 seconds or so. Add the sugar and blend again for 15-20seconds. Add in spices, alcohol, milk and cream and blend until combined, about another 10 seconds. That’s it! 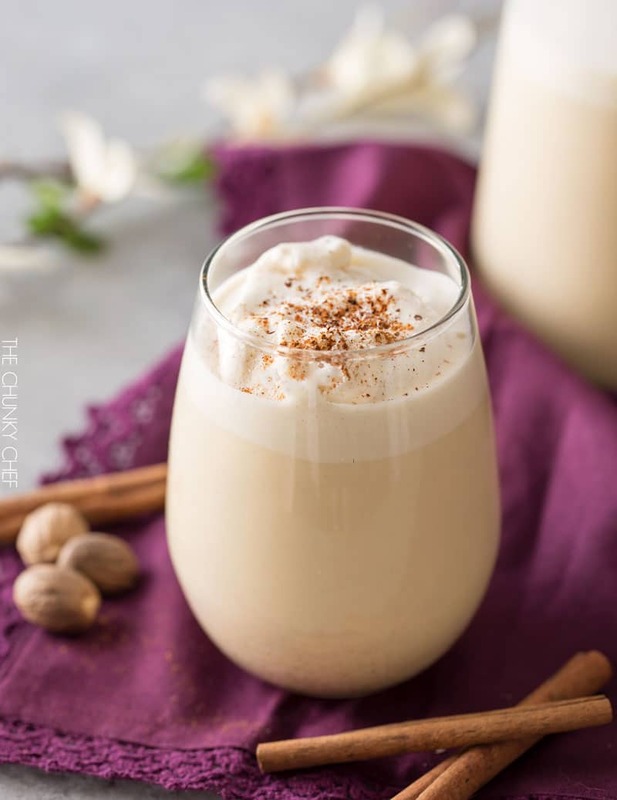 It may be tempting to drink your eggnog right away, while it’s still all frothy and fresh… and you can… but it will taste best if you age it a little. Traditionally eggnog was aged for weeks, even months! Remember, the alcohol acts as a preservative, so it’s safe. 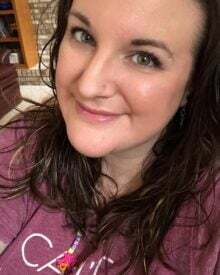 I like to age mine at least a day or two, and up to 2 weeks. It could probably go longer, but I like to be a little cautious. I just pour my eggnog into an airtight container in the refrigerator and let it hang out in there… tempting me each time I open the refrigerator doors lol. There are a few classic alcohols used in eggnog…. bourbon, brandy, rum, and cognac. My personal favorite is bourbon and cognac… it lends to a really smooth, luxurious eggnog. But as always, this is YOUR eggnog… so add whatever alcohols you prefer. A general rule of thumb though, is that brown liquors are best. I hope you all give this eggnog a try this holiday season (or any season really)… once you try homemade, you won’t want any store-bought eggnog again! Ninja Blender – Smooth, powerful, and not terribly expensive… this is my go-to blender for everything! Hermetic Glass Carafe – I LOVE this vintage look, and it ensures a real airtight seal! 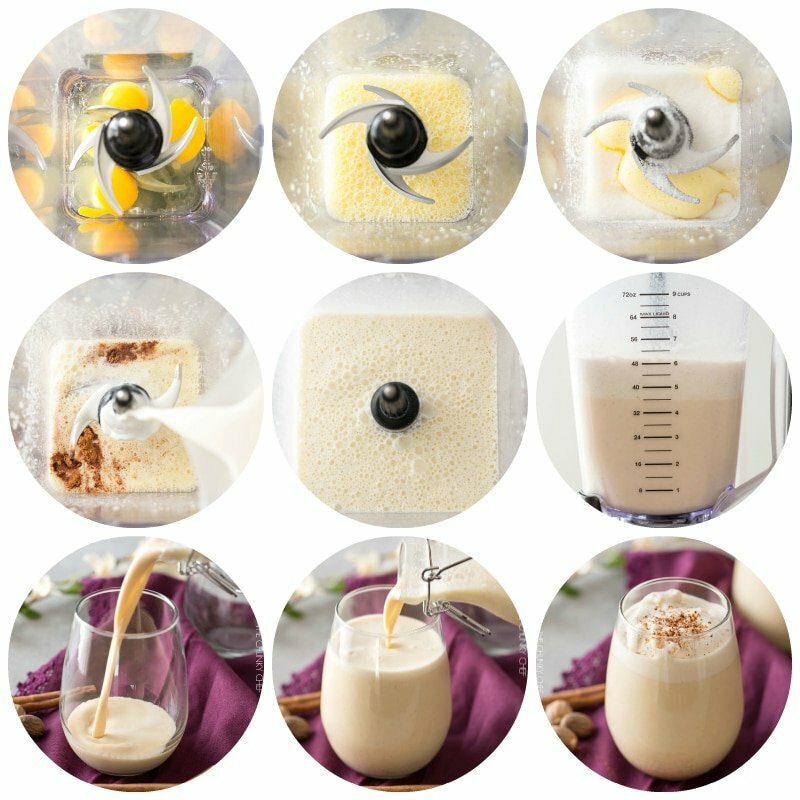 WANT TO TRY THIS BLENDER EGGNOG? PIN THEM TO YOUR DRINKS OR HOLIDAY BOARD TO SAVE FOR LATER! Add whole eggs to blender and blend on MED speed (or LOW if you only have a HIGH and LOW setting option) for 30 seconds. Add nutmeg, cinnamon, cognac, bourbon, milk and heavy cream and blend until combined, about 10-15 seconds. Transfer to an airtight container and refrigerate for a day or so to allow flavors to combine and mellow. 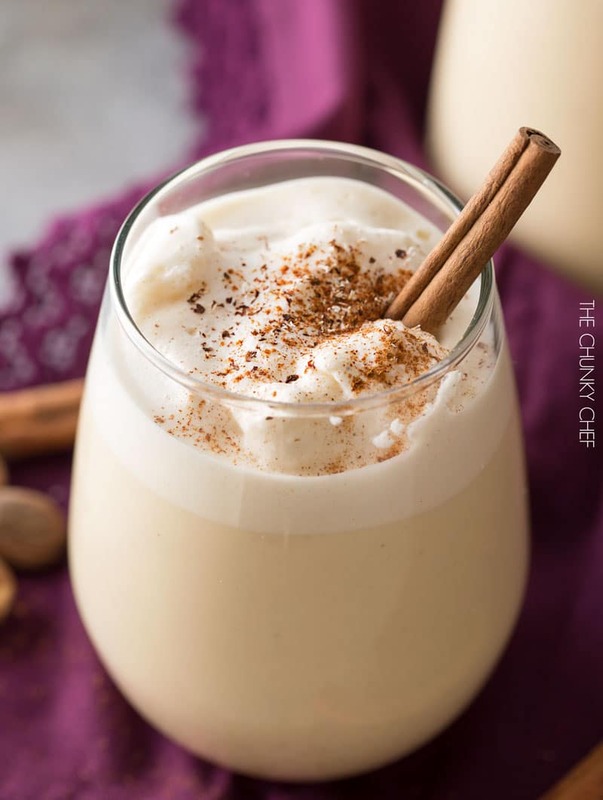 Eggnog may have settled in the refrigerator, so either give it a good shake or two, or pour into a mixing bowl and give it a whisk to get everything combined. 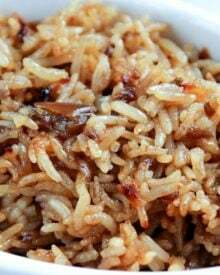 Serve with some additional grated nutmeg on top, and an optional cinnamon stick. Feel free to taste test and adjust the amount of alcohol to your tastes! In a large mixing bowl, beat egg yolks until lighter in color. Add sugar in 3 batches, beating after each addition, until fluffy. To a saucepan, add milk, nutmeg and cinnamon and heat over LOW to MED-LOW heat, until steaming but not boiling. Take 1 cup of hot milk mixture and SLOWLY, while whisking continuously, pour it into the egg yolk mixture. This tempers the eggs and ensures they won't scramble. Transfer tempered egg yolk mixture to the saucepan with the rest of the steamed milk. Cook over MED heat, stirring constantly with a wooden spoon until mixture has thickened somewhat. 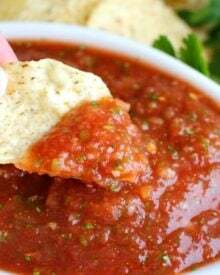 You'll know it's ready when you dip the wooden spoon into the mixture, turn it over and run your finger down the back of the spoon, and the mixture coats the spoon but leaves a bare line where you ran your finger. Don't let the mixture boil! Take mixture off the heat and stir in the heavy cream. Let cool for approximately 1 hour. Stir in cognac and bourbon and transfer to an airtight container and refrigerate for a day or so before serving. If you prefer a thicker eggnog, beat egg whites on MED/MED-HIGH speed until soft peaks form. Add a pinch of sugar and beat until stiff peaks form. Fold whipped egg whites into eggnog mixture before serving. going to try this using fireball cinnamon schnapps for the alcohol and have to sub for the heavy cream but gonna give it a try. Best eggnog I’ve ever had. I was generous with the alcohol and a little stingy with the sugar and it turned out fabulous! omg its simply DELICIOUS… made this yesterday and my guests keeps coming back for more….BRILLIANT!! This is so awesome! Store bought is too thick, this is just perfect! What would be the recipe for 8 servings in a small cup? I would double all the ingredients, and whatever is leftover, you can keep in the refrigerator. I Can not drink any alcohol, can you think of a substitute? Kombutcha?? You can omit the alcohol completely, it just won’t last as long in the refrigerator. So tasty! I actually prefer a thinner eggnog so subbed 2% milk for the whole milk and cream. I added a bit of vanilla and it’s fantastic. I have to go buy a dozen more eggs because I’ll be drinking this nonstop for the holidays! Thank you! how long can I store this in an airicontainer in a refrigerator ? Thank you! I just made it, and I used Havana Club aged rum. It’s already delicious. Can’t wait to taste it tomorrow night! 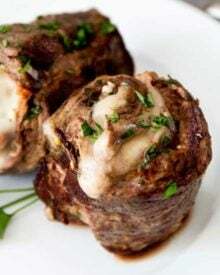 Can I use an immersion blender to make this recipe? I haven’t tested the recipe that way, so I can’t guarantee it, but you’re welcome to try it. After it’s aged for a day in the fridge, can I warm it up to drink? Or would that turn out badly? I want to take this on a Christmas stroll and I think it’d be best hot. Thoughts! 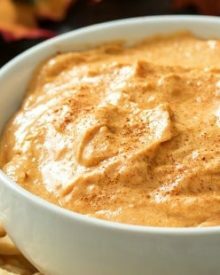 Id really love yo try this recipie but, dont like liquor in my eggnog. And i assume cognac is alcoholic also? Can i jus omit these 3 ingredients? Will this recipie be thick like store bought eggnog? Found this recipe by accident, keep going back to it for “no cook”. I still use the recommended 6oz of liquor, but I use 2/2/2 of cognac, bourbon, and rum. Goes down smooooth as can be, and def makes you feel nicely toasted. I have kept it in the fridge in glass jars, for sometimes 6 months. Still yummy then too!! Only nog recipe I will ever use! Five servings-what size are they? Approximately 6 oz per each serving. Know this is an old post, but hoping someone can answer for me. 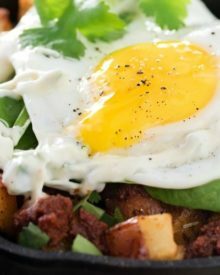 If I wanted to thicken it without using egg whites, is there another way? 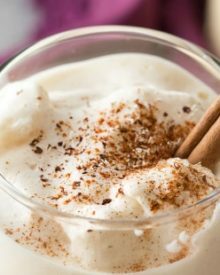 I’m allergic to egg whites but would love to make homemade egg nog. I grew up with the carton stuff in the US, but can’t get it here in the UK.im desperate for eggnog this year, so looking for an egg white free version. I’m thinking maybe upwhipoing up cream and gently adding to thicken it but not sure if that would actually work. Any other suggestions or ideas you could share, please? Thanks! …fake eggs ,I don’t think it can be called eggnog …? Hi Sassy, I have issues with drinking egg whites… not sure where it comes from, but I make eggnog every year using powdered milk to thicken it up. If you beat the milk/cream mixture and add about 1/3 of a cup of powerdered milk to every 1 cup of liquid milk/cream, then whip it until it’s nice and frothy and thick, then i add in the egg yolks, sugar and spices. You can also add alcohol at this point, but we don’t normally. I find the eggnog also stays a little more stable, less separation, with the powdered milk. You don’t have to use egg whites. I have a good raw eggnog recipe that only calls for yolks. Do include the yolks though (otherwise I wouldn’t bother.) If a recipe calls for 4 eggs, use 8 yolks. 2 yolks = 1 egg. If you beat/whip the heavy cream a bit before adding, it thickens the eggnog. Not too long that it turns into whipped cream, just enough to thicken the nog. Should work perfectly. Have you ever made it with rum and if so how much? We needed some eggnog for a cake recipe we like for Easter. No eggnog available at any of the stores. My wife made this up quickly. Instead of the alcohol used 2 tsp. vanilla extract. Let it cool and it is delicious. I like it better than any store bought eggnog I’ve ever had (and I’m 68 years old). Kudos to you Amanda. Thanks so much for sharing. I will try eggnog this friday with brown liquors as you suggest. Thanks. Could you use egg beaters? What if you want to make it for kids? Could you add rum extract instead? To get that thick, rich flavor, you really need the egg yolks, but I have seen eggnog made with egg beaters before. It still tasted pretty decent, but was definitely on the thin side. Yes, you can omit the liquor and leave the recipe as is, or add a splash of rum extract for the kids 🙂 Just know that without the alcohol, it won’t last more than a couple of days in the refrigerator. If we don’t use cognac, should we double the bourbon? I did that, and it’s fine. *hic!* ? I searched for eggnog recipes, and yours appeared with quite a few others. It was the 5-minute claim that hooked me. Then not needing to cook it sealed the deal. (Not that I don’t like to cook, it’s just that I’m on holiday in a cabin in the woods. Reading and hiking are the first order of business.) 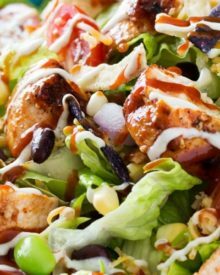 Thanks heaps for posting this recipe! I used my Vitamix so it was made really fast and without a lot of cleanups afterward! I think one of these days I will give it a go. DAD is the designated Egg Nog maker in our family. And when we’re were separated by 1300 miles for 2.5 years, I just didn’t feel like making my own and purchased the dreaded carton nog. Always a disappointment after having homemade. I don’t like how unnaturally thick carton nog is. I’m the odd ball out when it comes to nog. I like Butterscotch Schnapps in mine! Yum. Give it a try. Thank you for the recipe. Can’t wait to try. Hi Margaret! I don’t like the taste of alcohol, do you taste it in this recipe? I made this a couple of days ago to serve for Christmas dinner. It was amazing. I’ve always liked egg nog, but I love this recipe and I don’t think I can drink store bought egg nog ever again. It was a huge hit. I only wish I’d made more. Hi Margaret 🙂 I’m SO happy to hear that you all loved this egg nog as much as we do!! I’ve tried it. And it was fantastic! Eggnog really is a must for Christmas! Thanks for the recipe Amanda. How about with no alcohol for children? Hi Anne 🙂 You can certainly just omit the alcohol to make a kid-friendly drink… although it won’t keep more than a day or two in the refrigerator. 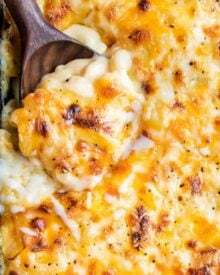 I am making this tonight…that is all. Thomas is the eggnog lover in this house. I didn’t know that the alcohol in eggnob is what keeps it safe with the raw eggs (for the traditional version). How neat! Love the blender one recipe! I LOVE eggnog this time of the year! And this blender version sounds and looks amazing! 🙂 However, I am slightly lactose intolerant and usually buy the Silk eggnog and add my own booze to it. Do you think I can make this dairy free with coconut milk and cream? 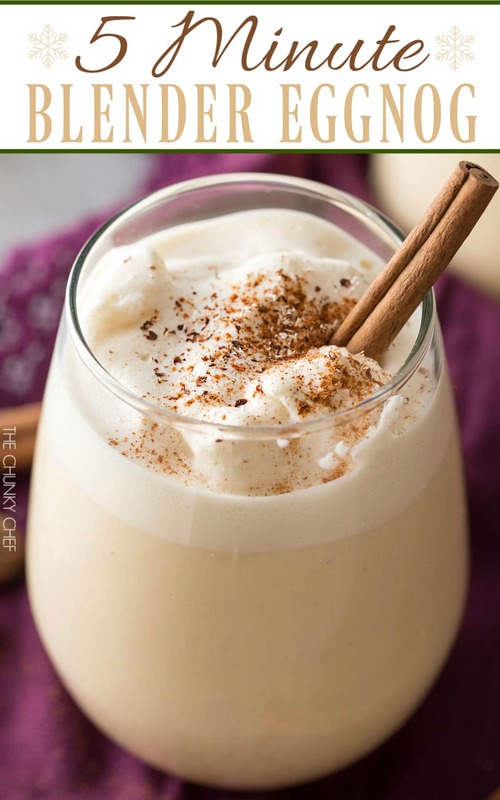 I never realized eggnog could be so simple to make! And I love that it can hang out in the fridge, waiting on you! I LOVE egg nog! It’s one of my favorite parts of the Holiday season! I cannot believe that this is SO easy! We love egg nog but don’t usually make it! I love how easy and quick this is, means I can enjoy all the time! So quick and easy, perfect for the holidays too! I love it!